The Decimal Human Number Line! This week, we have been delving deeper into our decimal knowledge. One of our fun activities was making a human number line. Some children wrote numbers with two decimal places on whiteboards. The rest of the class had to move them about from smallest to largest. Look at the picture... do you think they got it right or wrong? Why or why not? Over the past couple of weeks, 4NS have been getting ready for Christmas. First, we saw Santa on the Santa Bus and we all got a present and sang Jingle Bells. We performed our song "Please don't buy me a handkerchief" in the outdoor Christmas concert. Next we had a Christmas party in our classrooms, complete with party games in the hall, a mini-feast in our classrooms and some more games afterwards! A HUGE thanks to all our children and grown-ups who brought in lots of goodies for us to eat and plates/cups/napkins as well. We appreciate your support! We hope everyone has a wonderful winter break and we'll see you in the New Year! In our Connected Curriculum lesson this week, year 4 tried their hand at being directors, camera people, actors and scriptwriters to produce a mini earthquake movie. They used iPads to film each scene and watched them back to edit the footage together. You can tell by the smiles on their faces that the children thoroughly enjoyed the movie-making process! Great digital literacy skills, year 4! Here are the spellings for Spring 1 in Year 4. Spelling lists will be sent home at the beginning of the half term. Please practise the spellings for each week with your child at home using a range of strategies and tick the ones you used on the homework sheet. This week in Year 4, we have been looking at decimals. Children used place value lines and dice to create random decimal numbers. They then practised saying the numbers out loud, not forgetting to say "point" for the decimal point. Can you say the decimal numbers on these children's place value lines? A couple of weeks ago, the whole school had the opportunity to vote for their class school council representative. Some children chose to prepare a speech at home, explaining why they would be a good choice. They had to remember what Mrs Ranyard told them in assembly about being a good listener and sticking to a project for the benefit of others. After they delivered their speeches, the rest of the class had special ballot papers to choose the best person for the role. The downstairs meeting room was converted into a polling station, complete with private booths, just like adults use in real life! Every Wednesday morning year 4 go swimming to East Manchester Lesiure Centre. At first some of the children were scared to get into the water but now everybody is doing really well with their swimming through perseverance! Some children have already received their 5metres and 10metres certificates. Keep it up year 4!!! Year 4 are computer programmers!! This half term in year 4 we are learning to be computer programmers. We are using a program called turtle art to explore sequencing a set of instructions. 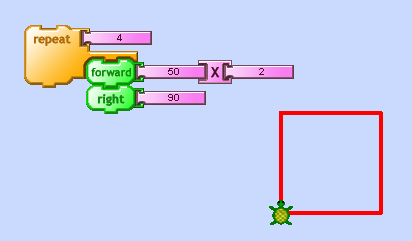 This week we practised dragging programming blocks to draw a variety of shapes. We then used the repeat button to make the instructions simpler. We are looking forward to extending our knowledge next week. As part of our school improvement goals to improve spelling at Ravensbury we will be using a new spelling programme called No Nonsense Spelling. Spelling lists will be sent home at the beginning of each half term. Please practise the spellings for each week with your child at home using a range of strategies and tick the ones you used on the homework sheet. Today, year 4 were practising their editing skills in pairs. They reviewed the 5 parts of their disaster story by checking for punctuation, missing words and making sense. Then they used purple pen to fix their errors and improve their work with juicy adjectives and adverbs! Today, Year 4 used 0-9 dice to play a 4 times tables game. They had to roll the dice and times the number by 4. If the number was in their line, they could cross it out on the page. First person to cross all the numbers out wins! You can download the template below to play at home with your child. There is a random number generator on google that you could use instead of a dice. Click here to use it. To help us with our newspaper report, Year 4 tried their hand at some drama by pretending to be reporters and the infamous Mayan god of chocolate, Kukulkan. They used pens as microphones and writing jotters to note down quotes from Kukulkan after he had stolen a cacao tree from Paradise. Clearly a controversy that would make quite a news story! In year 4 we are having a real push on children learning their times tables and division facts and we need your help at home! We are starting with 4,8,3 and 6. Please try and learn them at home and include the division facts. The children need to be really quick when they recall the facts. We will be having 10 minute practice times every day in school and a test each Friday where they will be able to achieve a bronze, sliver or gold level certificate. Remember repetition is the key! Keep on learning. Year 4 were lucky enough to receive a visit from a Mayan man! Big Nose was head-to-toe in traditional Mayan dress with a magnificent headdress to show his importance in his community. He brought raw cacao for us to try and helped us to create drama performances about Mayan culture. Year 4 had the opportunity to work with Mrs McAffer to create Mayan tiles and headdresses. The tiles were made out of clay and painted once it had dried. The headdresses were drawn onto card and coloured in using oil pastels before being cut out.